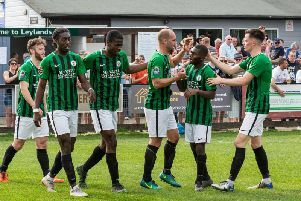 It was the perfect Non-League Day for Burgess Hill Town. The Kick It Out campaign was at the Green Elephants Stadium to celebrate Non-League Day. Simon Wormull and John Rattle made four changes from the side who picked up a point at Bishop’s Stortford, introducing Michael Wilson, Gary Elphick, Gary Charman (after a injury to Ben Pope in the warm-up), and Aaron Smith-Joseph to the starting XI. In front of a bumper crowd of 651, the first opportunity fell to Haringey, as Josh James prevented Akinwande from close range. The Hillians number one was called into action 10 minutes later, as he produced another fine save before Akinwande blasted over from close range. In the 31st minute, it was the Hillians that took the lead, as Kieron Pamment cut in from the left and rifled his effort into the far corner. Charman and Pamment both had chances to double the Hillians’ lead before the break, but to no avail. Whatever was said in the Haringey dressing room at the break clearly worked, as Joel Nouble brought his side level within 60 seconds of the restart. But as they say “anything you can do, I can do better”, as Lukas Franzen-Jones’ sweetly struck effort found the bottom corner, just moments later, to restore the Hillians’ lead. With 15 minutes remaining, Pat Harding pasted up a golden opportunity to extend Hill’s lead, as he blasted his effort over the crossbar - following some brilliant work by Pamment. The Hillians’ first victory of the league season was confirmed in the 91st minute, as Pat Harding netted past Pajetet. What a perfect Non-League Day!